The chickenpox virus is highly infectious and is usually spread in airborne droplets when an infected person coughs or sneezes. It can also be spread by contact with the fluid from the chickenpox blisters. The infection usually starts as a rash that spreads all over the body. The rash begins as red itchy spots that eventually become blisters. People can spread the virus from about 1-2 days before the rash emerges until the last rash dries up, about a week later. The total number of chickenpox blisters is usually between 250 and 500. Factors affecting scarring include age, skin colour and whether a separate skin infection also develops.1,3 Scarring resulting from chickenpox has been shown to occur in approximately 19% of children with an average of 3 scars per child.3 In many of these cases (40%) the scars are found on the face. The treatment approach to chickenpox depends on a number of factors, including the risk of complications to the person infected. Treatment of chickenpox is based on treating the symptoms and the use of antiviral agents, such as acyclovir; however, antiviral treatment has a limited effect and must be started as soon as possible after the rash first develops. Prevention of infection by vaccination is the optimum approach for the management of chickenpox. The vaccine is not currently available on the NHS and has never been part of the childhood vaccination programme in the UK. It can be given from the age of one year onwards. Its vaccine contains a weakened form of the chickenpox virus. It works by causing the body to make its own protection (antibodies) against the infection. This vaccine can be administered to healthy children 9 months of age and older. It can be given at the same time as most other childhood vaccinations and is administered under the skin as a separate injection from the other vaccines. It should, however, be remembered that no vaccine is 100% effective in preventing disease and that vaccination in children under the age of 1 year is an unlicensed use of the vaccine reserved for exceptional circumstances. About 9 out of every 10 people who are vaccinated against chickenpox will be protected against moderate and severe disease. The exact duration of protection is unknown, but one study indicated that protection would last for at least 25 years after vaccination. The vaccine is very well tolerated, as demonstrated in clinical studies involving more than 5,000 individuals. The side effects (viral symptoms such as fever and aching) are generally mild and usually clear up within a few days. As with other vaccines local reactions can occur around the injection site such as soreness and redness. 1. Avoid suffering isolation, itching, blisters and discomfort. 2. Avoid long-term scarring of the body from chickenpox blisters, which can occur in 18% of children – more than 40% of these children will have scarring on their face. The chickenpox vaccine provides protection against the varicella zoster virus that causes chickenpox. The chickenpox vaccine is not part of the routine childhood vaccination schedule. The vaccine is currently only offered on the NHS to people who are in close contact with someone who is particularly vulnerable to chickenpox or its complications. 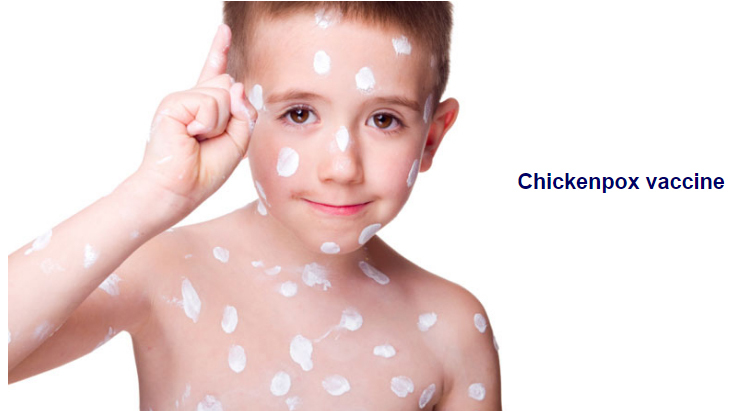 Chickenpox is a common childhood infection. In most cases, it’s mild and complications are rare. Almost all children develop immunity to chickenpox after infection, so they usually only catch it once. The disease can be more severe in adults. people who have weakened immune systems through an illness such as HIV or through treatment such as chemotherapy. Pregnant women. Chickenpox can be very serious for an unborn baby when a pregnant woman catches the infection. It can cause a range of serious birth defects, as well as severe disease in the baby when it is born. The chickenpox vaccine contains a small amount of weakened live varicella zoster virus. The vaccine causes your immune system to produce antibodies that will help protect against chickenpox. Find out about chickenpox vaccine side-effects. The vaccine is given as two separate injections, four to eight weeks apart. Who should consider the chickenpox vaccine? It is recommended for individuals such as certain healthcare workers and people in close contact with someone who has a weakened immune system. This is to reduce the risk of spreading the infection to those at risk. For example, if you were having chemotherapy treatment, it would be recommended that non-immune children close to you are given the chickenpox vaccination. The vaccine would also be recommended if you were about to start work in a radiotherapy department and you had no previous history of chickenpox. It has been shown that nine out of 10 children vaccinated with a single dose will develop immunity against chickenpox. A two-dose schedule is recommended, as it gives an even better immune response. The vaccination is not as effective after childhood. It’s estimated that three-quarters of teenagers and adults who are vaccinated will develop immunity against chickenpox. If you are worried your child has a rash that could be chickenpox, check out this childhood rashes slideshow to see if the rash is a typical symptom of chickenpox or another childhood condition.